June is here, so is Europe's largest housing conference. Organised by the Chartered Institute of Housing, Housing 2018 will happen between 26th and 28th June in Manchester Central, and it is set to be the biggest yet. Home Connections, as the most innovative software house and social enterprise, wouldn’t miss it! 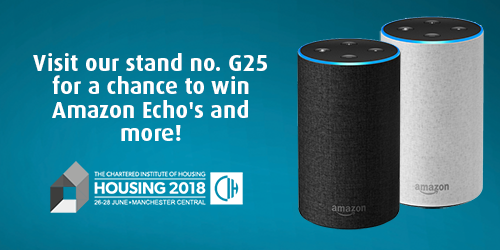 We have an Amazon echo, an Amazon Echo dot and high street vouchers to give away over the 3 days of the Housing 2018 conference. See us at stand G25 and get a unique 'Combination Code'. Will you have one of the winning Codes to open the safe? Home Connections specialises in delivering housing needs software including choice based lettings, housing options wizards, housing registrations, homelessness case management and much more. We offer full integration to all third-party systems. We are an innovative boutique housing solutions provider behind Homefinder UK - the only national housing mobility scheme in the UK which advertises immediately available social housing and offers 'Case Management' services to help house applicants nationwide. If you haven't registered yet to participate in the Housing 2018 conference, you can still reserve your spot!